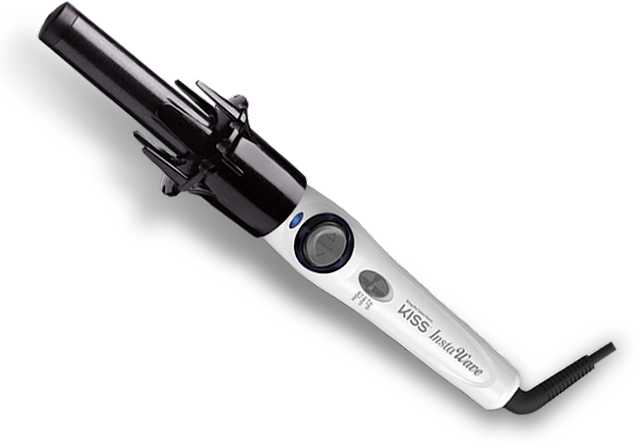 It seems as though in the last few years, traditional curling irons with a clamp have been becoming less and less popular. They did their job, but you had to put in a little extra effort to get the perfect looking curl and somehow you'd still end up with crimped ends which wasn't a cute look. Then we started seeing those same wands but with the clamps removed with larger barrels and even cone shaped ones which give hair those loose, beach waves. 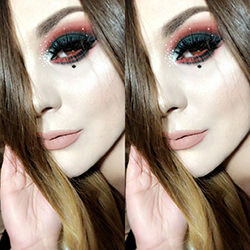 Today, we still see those wands but now more and more are popping up with modern updates. 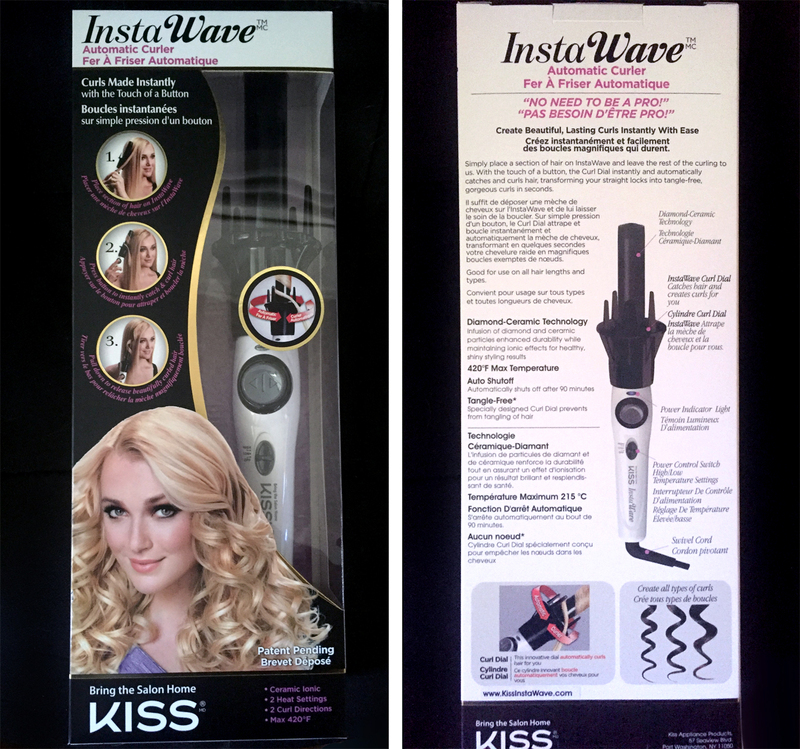 The KISS InstaWave is a new curling iron with a bunch of cool features. It’s a fully automatic tangle-free curler that will provide you gorgeous, curls/waves with just the touch of a button! The prongs rotate which gently catch your hair to create lovely curls. Best of all, it's so easy and fast to use once you get the gist of it. It can be used on both long and short hair of any texture! When I first saw the KISS Instawave, I have to admit that my first thoughts were "What's the point?" and "This is such a gimmick!" I felt like the prongs would tangle my hair and there would be a disaster on my hands. So yeah, I was a little nervous to try it at first. But after watching a few videos on YouTube and reading the instruction manual, I went for it! When I first plugged in my InstaWave, I instantly noticed a low, but high-pitched humming sound which was a little annoying. I have seen other people talk about this problem but it turns out that according to the manufacturer, it's normal to hear this whilst the iron is heating up. My hair is long, on the thicker side and naturally straight with just a tiny bit of wave in certain areas. With a traditional clip-less curling wand, it would take me about 45 minutes to curl and style my hair. With the instawave, it takes me about 30 minutes start to finish. Since my hair is long (mid back) and the barrel is pretty short, I like to start curling my hair starting mid shaft, press the Curl Dial, then manually twist the rest on my hair onto the barrel. One thing that I love about this wand is that even on the low heat setting, it curls my hair very quickly. I only have to hold the curl for about 5-10 seconds and my curls last for DAYS. I don't know how it does it, but it's amazing. I also like the fact that I can use the Curl Dial to easily curl my hair in opposite directions to give me a fuller, more naturally looking style. I haven't had my hair tangle in this which is great, but I do make sure my hair is completely tangle-free. I also suggest not using too much hair at a time or else you risk your hair getting tangled and/or jamming the motor. After curling all of my hair, I usually run my fingers through the curls to loosen them and I end up with a looser, more relaxed look which I prefer. I then mist my hair with a flexible hold hairspray. Overall, I think this is a great product for someone who wants to create curls quickly and effortlessly that seriously last and last. I also think it's awesome for someone whose arms get easily tired from curling their hair. You have to get the hang of it, but once you do, it's as easy as 1-2-3! I find myself reaching for this more often than other hair tools that I own. This would make a perfect holiday gift for anyone that loves big, bouncy curls. If you are interested in the KISS InstaWave, you can check it over at kissinstawave.com! It is also available at Target, Walgreens, Ulta, Amazon, Walmart, Harmon, and BJ's. i love beachy curls! i might have to try this one out! !